"On his own account he would like to offer his condolences to Victoria. 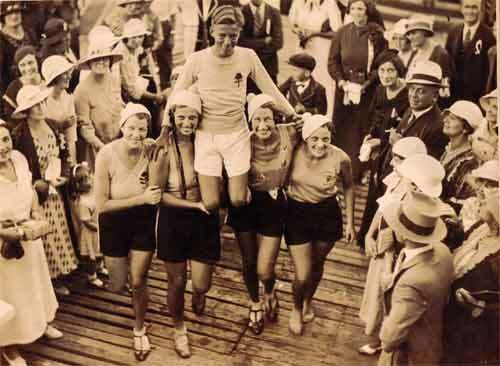 It was making a magnificent race when three or four unusually large waves got aboard with the usual result." The Victorian boat was swamped and damaged beyond repair in training. 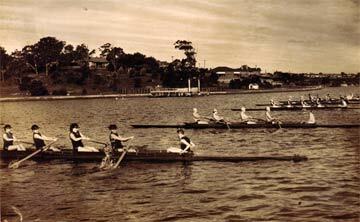 NSW raced the event superbly taking a lead in the first mile then rowed as cleanly as possible to avoid being swamped. The NSW crew selection had its problems. Keary wanted to make a change and the selector Williams refused to allow it. Keary resigned and the matter went to the Association who allowed the coach to make such changes. Williams then resigned but was prevailed upon to stay on. The sculling event was conducted in slightly better conditions and allowed an easy win to Turner. The event was raced in superb conditions on Hen & Chicken Bay and the start was competitive with NSW and SA the early leaders. NSW edged ahead and despite a spirited fight back by Queensland, they finish a length in front. SA was a further 1/2 length behind and Victoria stopped before the line but still managed fourth place. 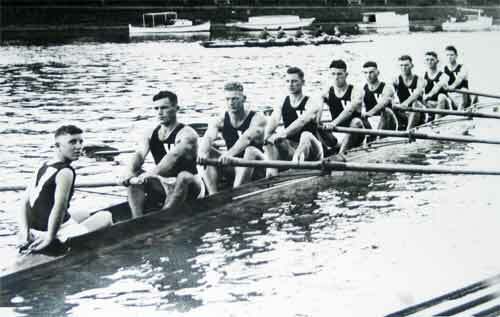 The Victorian crew hailed from the Essendon Rowing Club and had won the State Championship.